Credits go to: ArtisEverything, catnapcottage, Gilliauna, GlitzGlitter, HCJewelrybyRose, LollysCubbyhole, ME2Designs, MsBsDesigns, MyasEyes, penguinpapyrus, ragandbonedesign, SandsTea, StumblingOnSainthood, ThatSallie, TheLandofCraft, TheLodgeSpa and twoinspireyou. If you love owls, you're going to love this shop. And if you know someone else that loves owls that you're in the process of shopping for, today's feature shop is one you won't want to miss because your holiday shopping will be complete once you've stopped in to take a look around. 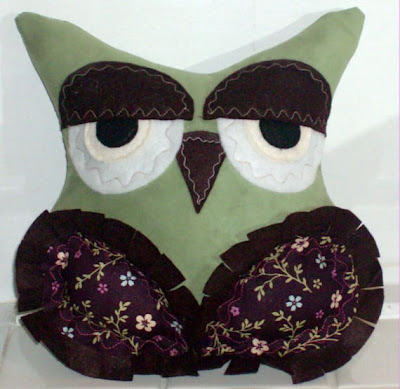 TheSleepyOwlTM on Etsy specializes in owl pillows like the one pictured here in this blog post. They come in all different colors and patterns, some with ruffles and some without but all with great big sleepy eyes and a nonplussed expression that's sure to make you smile just as they did me when I first stumbled across this shop. Also, don't forget to look through their sold items too! There's some cute designs and ideas in there as well including my favorite... a hot pink owl with fluffy fuzzy black feathers edging its wings instead of ruffles. 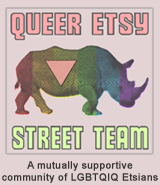 YOU CAN CLICK ON THE PICTURES ABOVE TO VISIT THESLEEPYOWLTM ON ETSY AND TAKE A LOOK AROUND OR, IF YOU PREFER, YOU CAN CLICK RIGHT HERE! I ran across a shop the other day that was so much fun that I had to share it with you. The shop is WineArtWednesdays on Etsy and they have one of the most fun shops I've seen in a long time. The concept behind this shop is simple. A group of seven friends and artists get together once a week to enjoy a little gossip, wine, slow food, and art every Wednesday evening! Over an evening of delicious food, good wine and a night of gossip, Alex Whatton, Audrey Grice, Denise Lohr, Jen Lamie, Joan Pilarczyk, Naty Carter and Rita Paradis paint the night away and then share their completed pieces in this wonderful shop! 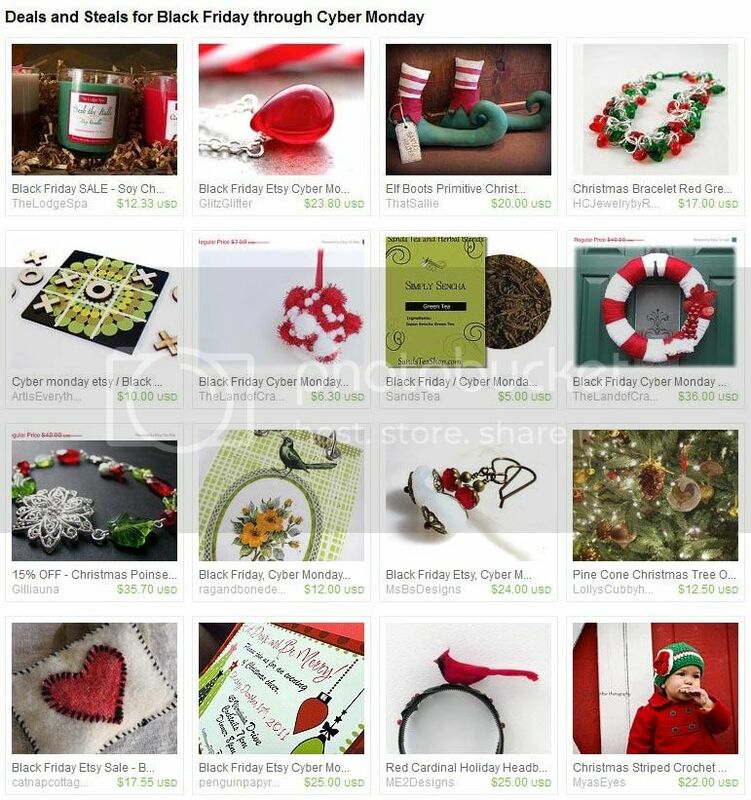 There are seasonal pieces and more, all gathered together to create a shop full of color and creativity that is filled with love and fun that overflows and comes through in every piece you'll find in this gallery of friends. YOU CAN CLICK ON THE PICTURE ABOVE TO VISIT THE WINE ART WEDNESDAYS GALLERY ON ETSY AND TAKE A LOOK AROUND OR, IF YOU PREFER, YOU CAN CLICK RIGHT HERE. If you like what you see in the WineArtWednesdays shop, you may also enjoy visiting the Wine Art Wednesdays and the Sober Blogger blog where the artists occasionally blog about their work, their time together as well as sharing promotional codes from time to time! When I was approached to feature this shop, she hadn't yet added her holiday items and I'm so glad I waited until she did! 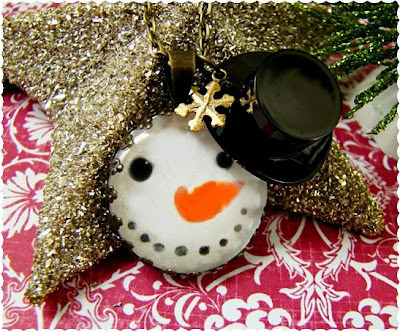 Otherwise I might have missed this adorable snowman necklace which has instantly become my favorite item in today's feature shop. Alyssabeths on Etsy is a jewelry shop on Etsy that specializes in vintage-inspired jewelry with a chic sense of style. Beth, the artist behind the design of these pieces of inspired jewelry, has a shop that's stocked full of everything from the classic pieces like bracelets, earrings and necklaces to jewelry sets, hair accessories and a wonderful budding Christmas section that's quickly filling with beautiful pieces for winter and the holidays! YOU CAN CLICK ON THE PICTURE ABOVE TO VISIT ALYSSABETHS ON ETSY AND TAKE A LOOK AROUND OR, IF YOU PREFER, YOU CAN CLICK RIGHT HERE! 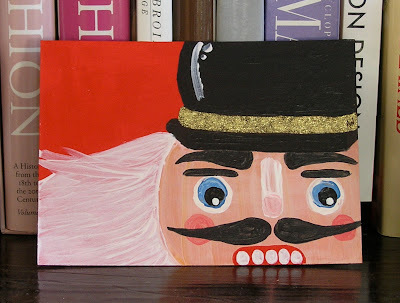 If you like what you see in Alyssabeths' shop, you may also enjoy visiting Alyssabeths' blog or website or stopping by to say hi to the artist on Facebook or Twitter! Creativity comes in a wide variety of talents and is spurred on by the imagination of the creator. Today's Monday Mosaic explores a variety of wonderful artists with an abundance of imagination and the talent to share the fantasies in their minds with everyone else! Blue Dog Rose - The Rabbit Tarot, Animal Paintings, Sculptures & More! Little White Rabbit paintings, bunny art and watercolors, the Rabbit Tarot, original animal sculptures and more abound in this beautiful and fanciful shop filled with wonderful ideas for home decor, nursery decoration and more. Not only can you find original artworks but also calendars, cards, books and lots more to browse through. Hand carved and hand modeled vessels and boxes inspired by the flora and fauna of nature. Each piece is breath-taking with beautiful detail and a quality that can't be matched. This talented artist's work has been included in the Spencer Davis collection which is held by the American Museum of Ceramic Art in Pomona, CA. Art dolls, mini dolls and photography prints combine in this shop with an original flair and a dark and gothic flavor. Whether looking for art to hang on the wall or tuck on a shelf, if you like creepy or are shopping for someone who does this holiday season, this shop is one you won't want to miss stopping by to take a look around. Adorable hand-built clay sculpture and vessels that are made with love to be one of a kind pieces that speak to the heart. Pieces are influenced by fairy tales and story books to a variety of historical and modern influences. Ornaments, clay animals and sculpture sit beside wall art, jars and vessels, plates, bowls, jewelry and more in this shop filled with sweet ideas and creativity to make you smile. With holidays just around the corner and the shopping season gearing up into full swing, don't forget to browse through artisan works and see what you can find, you'll be surprised at just how much creativity, originality and quality is out there!